Over the last two decades, the Cuban Revolutionary Armed Forces (FAR) has become an influential actor in the Cuban economy. Since the initiation of the Special Period in the early 1990s, key corporations and economic industries have come under the management of the FAR in what can be seen as an evolving “military entrepreneurship” in Cuban society. This economic sphere of interest has expanded to various sectors of the island, and includes areas such as agriculture, telecommunications, tobacco production and tourism (Klepak 2005). Various scholars have focused on the FAR in the hopes of having a better understanding of its economic role. In spite of the uniqueness of the Cuban military, most of the comparative research on the FAR still falls back on comparing it with other models of communist military institutions. This study intends to look at the FAR through a different and alternative model of military governance. The purpose of this paper will be to compare the FAR with the bureaucratic-authoritarian model (BA) that emerged in South America in the 1960s and 1970s. The BA regime was a type of military dictatorship that attempted to industrialize the economy by increasing foreign capital and investment, as well as employing domestic and foreign educated technocrats within local enterprises. It was first documented in Brazil (1964), Argentina (1966, 1976) and Chile (1973) (Collier 1979). The research questions will be stipulated as follows: What similarities, if any, can be identified between the FAR and the BA model, and what new conclusions can be drawn from such comparison when considering the FAR as an institution and its role in the Cuban economy? The first part will present a justification for comparing the BA regime with the FAR. The second will describe the BA model and present qualities and elements that are common in BA regimes. The third will present background information on the FAR and its endeavors in the Cuban economy, followed by a listing of certain characteristics of the FAR’s evolving economic role that both differ and are compatible with the BA qualities. The fourth section will finalize this paper with possible conclusions on the FAR and its future implications. There is much literature and research that establishes different definitions of the BA regime. Based on the purpose of this study however, the characterizations of the BA model will be simplified to the definitions given by Guillermo O’Donnell and David Collier. The characteristics defined by these two authors are used for two reasons. O’Donnell presented the initial definition of BA regimes, which he later re-defined in the late 1970s (Collier 1979). His definition is commonly accepted by most scholars and is used in this study to make a general comparison with the FAR. Collier gathered views from many authors on BA theoretical norms.2 He developed a synopsis and summary of adjusted definitions for BA regimes that will be useful in taking into account the gross as well as the subtle implications of the BA model. The BA model is commonly defined as a repressive capitalist state that specifically emerged to defend the capitalist system from social upheaval. Sun-Yu Ma went as far as to state that the BA model cannot be applicable to countries that have not had a strong capitalist experience (Ma 1999). Hence, the Cuban FAR case study is not a perfect example to compare with the BA model. Many authors even admit that the emergence of the BA model in South America can be tied to the threat many Latin American governments felt when socialism took power in Cuba in 1959 (Collier 1979). However, the Cuban regime has undergone many complicated transitions in the past two decades that have forced it to abandon some socialist principles and qualities. This may suggest that Cuba has evolved outside of socialist behavior and doctrine (Amuchástegui 2000). Useful comparisons and conclusions can be made between Cuba and a non-socialist model. It is important to note that this study does not seek in any way to treat Cuba as a BA regime, and does not engage in the already complicated debate of what constitutes a BA regime case study. This study is intended to (1) compare the FAR with an alternative military model in order to draw new conclusions on the institution; and (2) contribute to the comparative studies of the Cuban armed forces in order to support further research that compares the FAR with other non-socialist models. The BA model was initially studied as a way to challenge modernization theories on democratization and industrial development. According to classic modernization theory, capitalist industrialization and economic development in the third world tends to occur in societies that have experienced a steady wave of democratization (O’Donnell 1973). The BA model was documented by O’Donnell in the early 1970s in order to explain the rise of capitalist authoritarian regimes in South America that attempted to form private enterprises and stimulate industrialization by repressing popular democratic institutions and groups (O’Donnell 1973). O’Donnell’s explanation of BA regimes challenged many older theories that considered democracy a prime requirement for capitalism. Dominant Elitist Class: Only individuals who are in high influential positions of large organizations, state civil bureaucracy and the armed forces are included in the decision-making processes. This results in the elite class of society having most of the decision making power. Exclusion of the Popular Sector: This includes exclusion of political parties from the governance arena, and suppression of labor unions. Channels of access to the government and representation are suppressed or dissolved in order to eliminate chances of appeal, accountability and transparency. Western Orthodox Economic Techniques. These include attraction of foreign investment in order raise foreign capital and profits, and forming private business enterprise in order to stimulate industrialization. Employment of Foreign or Domestic Technocrats: These technocrats are economists and businessmen that stem from the civilian sector or the military itself. They are employed by the military institution to help with economic industrialization and reform. O’Donnell took the first steps in researching BA regimes in the early 1970s. This was followed by Collier, who along with other authors, engaged in a necessary debate regarding the evolution of the BA regime in the late 1970s. Whether or not BA regimes were a new type of authoritarianism was one prime issue in this debate. Collier summarizes three qualities in BA regimes that specifically make it a unique form of authoritarianism (Collier 1979). Centrality of a Coalition of an Oligopolies Bourgeoisie: This fact goes along with O’Donnell’s characterization of an oligopoly type of elitist class that stems from the state bureaucracy, the military and wealthy organizations. Collier adds that this upper class can also be composed of foreign businesses and organizations which are also in a coalition with the military. Institutional Military Rule: This implies that military rule is carried out at an institutional level, and not dependent on the decisions of one or few military officers. Military governance is carried out on a more decentralized bureaucratic approach, more related to an institutional entity. Influential Agricultural Sector: The role and relationship of the agricultural sector involves the use of landowners and their territory for capitalist gains. Collier summarizes that this may be characterized as a form of agro-business existence, i.e., having a private class stem from the agricultural sector. The FAR presence in the Cuban economy can be traced back to the early years after the triumph of the Cuban revolution in 1959. Rebel army soldiers that took part in the defeat of Fulgencio Batista were appointed to manage farms, factories and shops in order to reconstruct Cuban society under the new leadership of Fidel Castro (Waters 1999). This informal presence continued through the 1960s. In 1973 the Youth Labor Army, or Ejército Juvenil del Trabajo (EJT) was established to employ young reservists and recruits to help with efforts in construction, manufacturing and agriculture (Espinosa 2003). By 1985 it became apparent to the Cuban government that they could no longer count on political and military support from the Soviet Union due to the perestroika and glasnost policies of Mikhail Gorbachev. Defense Minister Raúl Castro then argued for making the FAR more self-sufficient in order to lessen the dependence on Soviet supplies and funding. The FAR then began to manage ammunition, clothing and food factories in order to provide for military consumption. The Union of Military Industries, or Unión de Industrias Militares (UIM) was set up to help coordinate such efforts of self-sufficiency, including managing the supplies and financial resources of military enterprises (Klepak 2005). This role of industry management suddenly expanded with the collapse of the Soviet Union and the Warsaw Pact alliance in 1989. The Special Period, or Periodo Especial, officially began in 1990, opening up a period in Cuban history where Cuban citizens would undergo extreme levels of rationing due to the economic shocks being felt with the collapse of the Soviet Union. The FAR began to play a crucial part in the implementation of the Sistema de Perfeccionamiento Empresarial (SPE), or Enterprise Perfection System, which was designed to help increase effectiveness in Cuban industries by making them more market oriented and competitive in their economic output (Klepak 2005). FAR generals were assigned the task of managing, not just military-oriented industries such as ammunition factories, but civilian industries such as agriculture, telecommunication shops, hotels, restaurants and tobacco factories. This overall transformation of the FAR was intended to expand the military’s self-sufficiency practices on to the Cuban economy and lessen the burden on the national central budget (Klepak 2005). The military-managed enterprises, along with other reforms such as the sanctioning by the Cuban government of the use of the U.S. dollar by the Cuban population, and the rise of certain private professions, were able to save the Cuban economy from total collapse during the Special Period. By 1996 GDP growth had stabilized at 7.8 % from a drop of -10.7% in 1991, and Cuban exports increased to almost $2,000 million in 1999,3 89% of which came from FAR-managed industries (Mora 2004). By 2003 FAR military industries practicing SPE were set to increase to approximately 1,411 enterprises (Mora 2004). As of today, the FAR manages important and powerful corporations such as GAESA, Gaviota S.A., Copextel, S.A. and Cubanacán S.A., all of which have a specific area of interest in the Cuban economy. GAESA S.A. has become the main coordinator of all the FAR assets and interest within the civilian sector and it has out shadowed the UIM of the 1980s, which involved FAR management of industries that produced specifically for military consumption (Klepak 2005). Gaviota S.A. is one of the most prominent FAR corporations as it manages the allimportant tourist sector. Copextel S.A. focuses on producing electronic services and products for the Cuban population. Cubanacán S.A is a commercial company representing hotels and restaurants in the tourist sector. Other corporations such as Cimex S.A and ETECSA S.A work with foreign investors, giving the FAR an emerging international reputation (Klepak 2005). Three types of soldiers have emerged with the increasing role of the FAR in the economy. Juan Carlos Espinosa, Jorge I. Domínguez and Frank O. Mora each present one of these three typologies. Discussing these three typologies can help explain the function of the FAR in the economic arena, and show how the FAR can be compared to the BA model. The first type, the civic soldier, coined by Domínguez, is trained to conduct different types of tasks within the FAR’s economic sphere. This includes working in agricultural farms, hotels, restaurants and stores. Domínguez describes these soldiers as “men who govern large segments of both military and civilian life…bearers of the revolutionary tradition and ideology…who have dedicated themselves to become professional in political, economic, managerial, engineering and educational as well as military affairs” (Mora 2004, 4). This type of soldier goes back to the initial years of the Cuban revolutionary government, when the rebel army took on many economic tasks to re-construct Cuban industries. Civic soldiers were particularly involved in the re-building the Cuban agricultural industry and were mostly responsible for managing the economic sector during the 1960s, as well as playing a crucial role in the EJT in 1973; they can be seen today in agricultural units and constriction projects (Mora 2004). The second type, the technocrat soldier, coined by Frank O. Mora, is trained to manage state-owned enterprises. This type of soldier began to make a presence during the late 1980s in the context of the SPE industrial reforms. These soldiers are charged with the tasks of managing FAR businesses, which include oversight of hotels, agricultural farms, shops, restaurants and taxi companies (Mora 2004). Mora states that technocrat soldiers speak the language of “costs and benefits, of necessary lay-offs, of responding to market demands and mathematical models, and relying on principles of financial engineering and computerized system and complex telecommunications AND not in giving orders or resorting to extra-economic coercion” (Mora 2004, 9). Finally, the third type is the entrepreneur soldier, who is at the highest level of the military hierarchy, as well as the military economic empire. These soldiers were described by Juan Carlos Espinosa as having the specific purpose of making a profit in the business making aspects of the FAR. They are characterized as having more autonomy and greater access to the dollar- oriented sectors of the Cuban economy. In comparison to the civic soldier who works in the EJT and the technocrat soldier who manages hotels and stores, the entrepreneur soldier works in the S.A. enterprises (sociedades anónimas). These include FAR corporations such as Gaviota S.A. and Copextel S.A. that deal with foreign investors to generate profits (Espinosa 2003). The importance of these three soldiers is that their relationship to one another, and their roles in the FAR economic sphere, closely relate to Collier’s and O’Donnell’s research on BA regimes. The relationships between different sections and organizational unit within the BA regime resemble these three typologies of FAR soldiers. This study will take a further look into these aspects. The characteristics of the BA model set out and summarized by O’Donnell and Collier can be compared to the FAR’s role in the economic arena. However, based on the FAR and the socialist context of the Cuban example, some qualities of the BA model will simply not fit completely with the FAR case study. The characterizations of the roles of the agricultural and popular sectors described by O’Donnell and Collier are perfect examples of this. The agricultural sector in Cuba plays an important role in the military’s economic presence, with the EJT and civic soldiers engaged since the 1980s to help increase agricultural production. This includes autonomy in managing a separate military market for agricultural food products (Togores and García 2004). This characteristic resembles the landowner class that emerges in BA regimes and initiates capitalist agricultural reform. Yet this fact cannot be overemphasized in the FAR context. The role of the civic soldier and the EJT in the agricultural sector is important, yet it pales in comparison to the role the FAR plays in other areas such as tourism and tobacco production industries. This is partly due to the collapsing sugar production industry, which has led to an overall downturn in agricultural production in spite of the limited successes of agricultural activities by the military. Hence the role played by the FAR in the agricultural sector resembles the BA model and its use of the agricultural landowner class, yet this plays a more important role in the BA context than in the FAR context. The role of the popular sector is another case in point. O’Donnell sees the repression of the popular sector by the BA regime as an important characteristic. This includes repression of democratic institutions and groups, as well as the disbandment of representation channels that offer citizens a chance to claim accountability on the government. This repression occurs in order to protect the capitalist system of the BA regime. Similar repression occurs in the Cuban scenario, not to defend the FAR economic existence which is the focus of this study, but to protect the socialist political system. Examples of this can be seen with the constitutional amendments that were enacted to repress the 2002 Varela Project endeavor, the “Black Spring” incident of 2003, and the ongoing crisis of 2010 between the government and the Damas de Blanco, or Ladies in White group (Sweig 2009). Hence the repression of the popular sector in Cuba resembles the repression acts enforced in BA regimes, yet the Cuban repression is not directly related to the military economic presence. This implies that it does not hold any direct importance related to the FAR economic enterprises and industries. The agricultural and popular sectors may not play such an important role in the FAR’s economic existence in contrast to the BA model. Yet there are other BA elements that play a more crucial and important role in the FAR context. Technocratic Involvement and Orthodox Western Economic Techniques: O’Donnell stated that BA regimes resort to educated technocrats, such as engineers and economists, to help with industrial reforms within societies. In the Cuban context, the technocratic and entrepreneur soldier described by Mora and Espinosa play a critical role within the FAR’s economic existence. These two soldiers can be closely related to O’Donnell’s technocratic elements within BA regimes. These two types of soldiers took part in the educational programs that were carried out in Cuba in the 1980s. These programs included sending military officers to Western Europe and Latin America to study business decision making and economics, and was part of the SPE initiatives that aimed to increase effectiveness in Cuban industries. According to Domingo Amuchástegui, these educational programs consisted of seminars and workshops from the best economists from Europe, U.S., Japan and Latin America., as well as from institutions such as the IMF and the World Bank (Amuchástegui 2000). They also included courses on management methods from world experts like Peter Drucker and W. Edwards Deming (Mora 2004). In addition to these two types of soldiers, a supplementary note needs to be made for civilian technocrats who contributed to reforming specific industries. An example is the appointment in the late 1990s of Minister Ignacio Gonzáles Planas, a civilian technocrat, who helped set up the joint venture ETECSA S.A. between the FAR and the Italian company STET (Amuchástegui 2000). The work of these military and civilian technocrats and entrepreneurs enabled the FAR to implement the all-important SPE reforms in Cuban industries. The SPE reforms were enacted in the 1980s, abandoning the old Soviet model of Sistema de Dirección y Planificación de la Economía (SDPE), which consisted of central economic planning derived from socialist principles (Amuchástegui 2000). SPE is specifically derived from Western and Japanese capitalist efforts (Espinosa 2003). It was first experimented with the military-run UIM, and then expanded into civilian industries in the early 1990s. It consisted of the FAR abandoning or bypassing 100 socialist norms and adopting others, including laying off workers in order to save cost, measuring economic decisions on the basis of a cost/benefit approach, and adapting marketing reforms more accustomed to capitalist enterprises (Amuchástegui 2000). It also consisted of making Cuban enterprises more autonomous from the central government, as well as financing them with foreign capital from joint ventures and foreign investors (Klepak 2005). These actions have been implemented with much caution and with many limitations in order not to weaken the socialist political structure, but they do resemble the orthodox capitalist measurements typically seen in BA regimes. Despite much political rhetoric from Cuban officials that SPE is not a practice of capitalism, these reforms and the FAR technocratic elements that manage SPE resemble the same type of role seen in BA regimes in their employment of technocratic administrators and their practice of western orthodox economic reforms. Military as an Institution: Military governance anchored on institutions and not subjected to the decisions of a single individual is also important when considering the FAR. Since the beginning of the Cuban revolutionary regime in 1959, the leadership structure of Cuba has always been defined by Fidel and Raúl Castro. Yet research has shown that Cuba has adopted a more decentralized bureaucratic governance that is not completely centered on the leadership of the Castro brothers. Anthony Maingot explains that with the rise of President Raúl Castro, more power and decision making has been shifted to key FAR generals who have a stake in the political and economic sectors (Maingot 2007). These new FAR decision makers are characterized as the “Raulista” generals, who are loyal to Raúl Castro and consist of technocrat and entrepreneur types of soldiers described by Espinosa and Mora. Maingot explains that this is a shift from the charismatic leadership of Fidel to the primarily military bureaucratic leadership of Raúl, which is in many respect more decentralized and not so dependent on the persona of a single individual (Maingot 2007). This argument suggests that the FAR has grown to a position of power outside of Fidel and Raúl Castro. This is represented by FAR officials who have prominent positions in key corporations and government ministries which help manage certain sectors of the economy. Examples include high-level FAR officials like General Ramiro Valdés, General Julio Casas Regueiro and General Abelardo Colomé Ibarra, who have influential decision making abilities in their respective fields of the Cuban economy and political sector. General Ramiro Valdés was former head of the Ministry of Interior in the 1960s, and now heads the FAR Corporation COPEXTEL S.A. It should be noted, however, that Valdés has been identified as a potential rival to Raúl Castro and may not be considered a true “Raulista” (Latell 2005). Despite this, Valdés is a very influential officer within the FAR as he is tied to one of Cuba’s powerful SA corporations. General Julio Casas Regueiro was very influential in setting up the GAESA S.A. organization, and is considered as the second most important military officer next to Raúl Castro (Latell 205). General Abelardo Colomé Ibarra is head of the Ministry of Interior, which was shifted to FAR jurisdiction in the early 1990s. These three individuals are among the most important officers in the FAR (Latell 2005). Yet other officers, such as General Luis Pérez Róspide, head of the all-important Gaviota S.A., General Eladio Fernández Civico, head of Geo-Cuba S.A., and General Ulises Rosales del Toro, head of the Ministry of Agriculture, also represent this new bureaucratic approach of delegating power and decision making (Latell 2005). Hence despite the recognizable centrality of Raúl Castro in the leadership of Cuba, many of the elitist circles of the FAR possess much delegated authority and influence. Decisions are made by FAR personnel without complete control and direct authority from the Cuban president. This gives the FAR a bureaucratic type of leadership structure, and makes military decision-making more institutional. This fact resembles Collier’s summarized points indicating military rule as an institution within BA regimes. Upper Bourgeoisie Class: The entrepreneur and technocratic soldiers that compose the leadership circle of the FAR and the “Raulista” group, also hold positions within the nomenklatura group of Cuban policymakers. Similar and akin to the role played by a national and international bourgeoisie class that helps account for foreign capital and investment in the BA regime, the entrepreneur and technocratic soldiers produce foreign capital by setting up joint ventures between foreign companies and FAR corporations (Espinosa 2003). A good example of this are the FAR corporations Cimex S.A. and ETECSA S.A, that help produce electronic appliances and telecommunication products with foreign capital from Italian and British investors. ETECSA S.A., under the leadership of Brigadier General Silvano Colas, and with the help of technocrat Ignacio González Planas, specifically formed a joint venture agreement in 2000 with the Italian firm STET (Amuchástegui 2000). The Gaviota S.A. Corporation is also presently funded by foreign capital from Spanish, German, French and Jamaican investors. Hence within the socialist governance of Cuba, the FAR is one of the few actors that has the capability to deal with foreign investors and fund its economic projects with foreign capital (Klepak 2005). This is an important trait in BA regimes. The “Raulista” and nomenklatura groups, which include many FAR officers from the three typologies, resemble the elitist class who play a key role in BA regimes. It may be controversial to label these groups as a “national or internationalize bourgeoisie,” but their relation to the FAR military institution resembles this key BA regime characteristic. 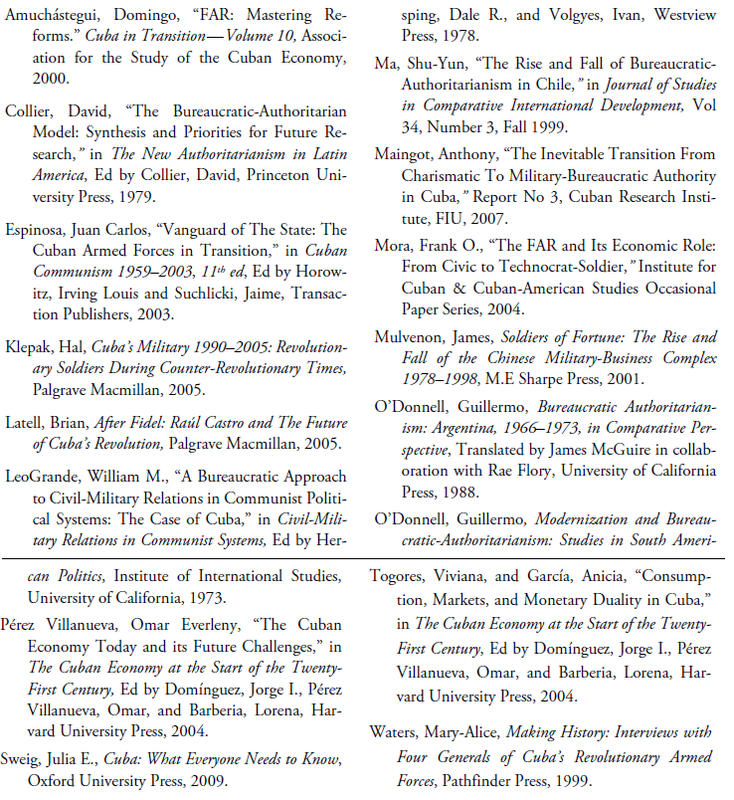 In identifying the similarities between the FAR and the BA model, this study points out that the FAR has become a dominant institution in Cuban society, which resorts to using foreign capital, as well as military and civilian technocrats, to help the regime survive economically. The nomenklatura and “Raulista” groups, which are composed of high-level military officers, function in a similar manner as the role played by the bourgeoisie described by O’Donnell and Collier. The heads of key FAR corporations, as well as governmental ministries, ensure military dominance in Cuban governance. This resembles the military existence seen in BA regimes. Communist oriented regimes such as China and Vietnam at one point employed their respective militaries in a similar fashion as the one just discussed in the Cuban scenario (Mulvenon 2001). However, these other examples of military participation in the economy have always been regulated and controlled by the communist party apparatus. The FAR and the Cuban case do not abide completely by this rule. Many scholars have argued that the FAR has overshadowed the Cuban Communist Party (PCC), as military generals and personnel have increased their participation in the economic and political sectors. This should not be considered abnormal. The FAR predates the formation of the PCC by more than five years and historically possesses more legitimacy as an institution. The FAR is also one of the few communist- oriented military institutions that did not accept the use of political-ideological commissars from the local communist party (LeoGrande 1978). Hence, the main conclusion of this study is that through the organization of its military economic establishment, the FAR is leading the Cuban regime in becoming a hybrid entity with roots in socialist tendencies, as well as limited capitalist elements. This is not to say that the legitimacy of the Castro brothers has diminished or dissolved. One always needs to remember that the Cuba transition is an ongoing process, with many uncertainties regarding the country’s future. There is general agreement, however, that the FAR will play an important role in the country’s future path. The FAR has grown to a self sustaining institution that does not depend on a single individual or military official. This includes the Castro brothers. This is not to doubt the loyalty of the armed forces towards the Castro regime, but to suggest that the FAR has become an independent institution that can survive even without the Castro brothers. This study hopes to show how the FAR has expanded in its economic and political role, as well as to demonstrate how the FAR has grown outside of the traditional norms of communist militaries. It has demonstrated resemblances between the FAR and the BA model’s capitalist elements. This study seeks to encourage more comparative analysis on the FAR, not just with the BA model, but with other non-socialist oriented models. Such analyses can better help understand the understudied aspects of the Cuban transition and the future role of the Cuban revolutionary armed forces in Cuban society. 1. Editor’s Note: This essay was awarded First Prize in the ASCE 2010 Student Prize Competition for graduate students. 2. Such as works by Fernando Henrique Cardoso, Albert Hirschman and Guillermo O’Donnell. 3. Based on Omar Everleny Pérez Villanueva (2004), Officina Nacional de Estadísticas and Report of the Central Bank of Cuba. Michael Aranda is a graduate student in the International Studies MA program at Florida International University. He was born and raised in Guaynabo, Puerto Rico, and moved to Miami in 2003 to obtain a BA degree in International Relations from FIU. His graduate research focuses on civil-military relations in communist-oriented regimes and Latin America.